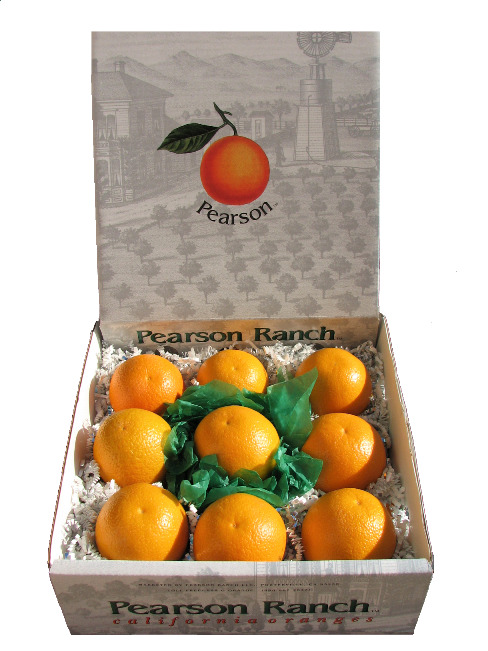 Orange gift boxes from Pearson Ranch are a great way to show someone how much you care! Each exquisite orange is hand selected and hand packed with delicate care to ensure that only the finest citrus arrives to your or your recipient's home or office. These special oranges are truly as close to perfection as you can get in nature. So give the gift of taste and health with a Pearson Ranch Orange Gift Box. Whether you choose the 9-Orange Gift Boxor the 8-Orange with Honey Gift Box, you can be assured you will be sending a great gift for the true orange lover in your life. **Corporate gift box sales are also available. Call us for more details 1-888-"O"-ORANGE...(1-888-667-2643). We are currently shipping Navel Oranges in all our gift boxes.